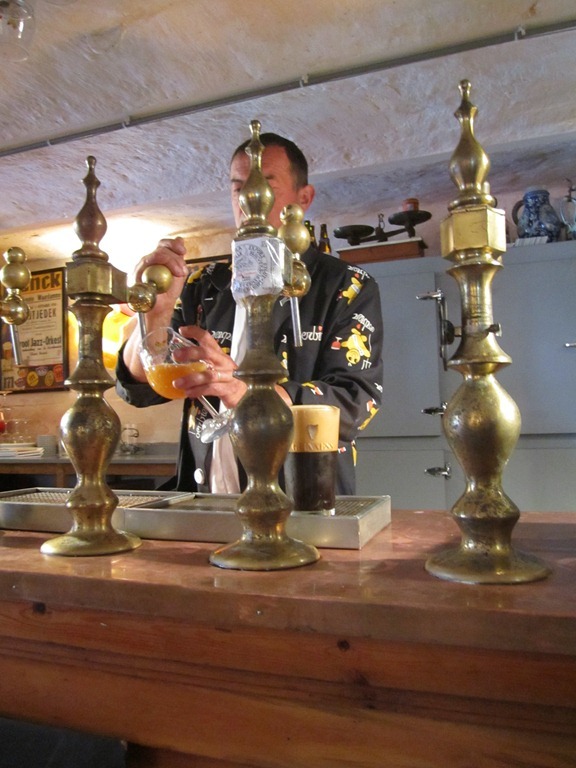 The following day we set out to get to the Van Honsebrouck Brewery in Inglemunster. 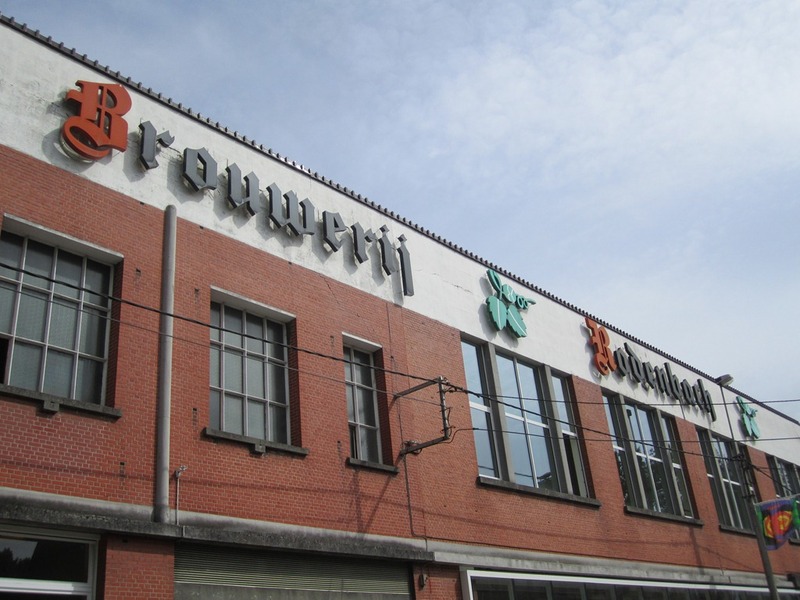 On our way we passed through the town of Roeselare and decided to stop at Brouwerij Rodenbach to see if we could maybe get a tour that day as well. Unfortunately we were told that they didn’t have any tours that day. As we were leaving, a guy named Bert came out and told us to at least check out the visitor center on the other side of the building. He walked us there and inside while telling us a little about their history, and expansion, and who else they bottle for. 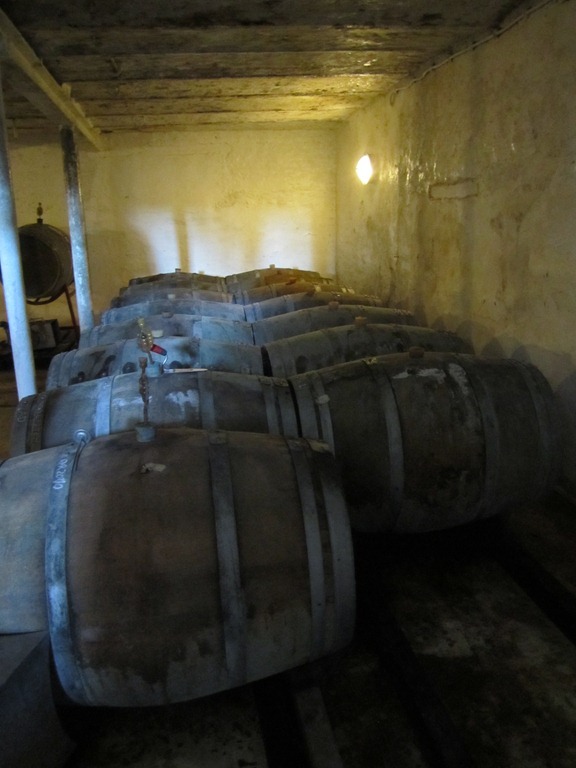 I peered in some glass doors and asked if we were allowed to walk in and check out the barrels. He origionally said no, but then looked around and said he wasn’t busy and he would come with us. Afterwards he even took us into the bottling area where he said they usually don’t allow visitors and tourists. If you look at the picture below and see the tank with all the bubbles? 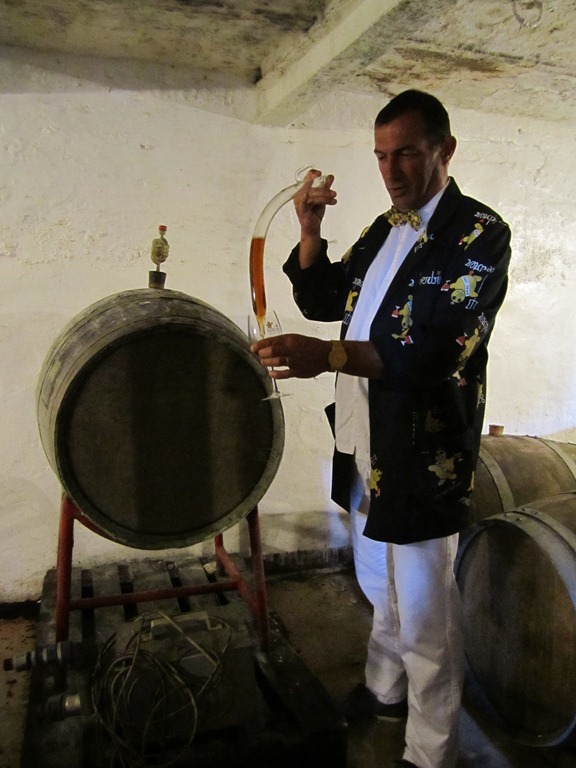 I was amazed that it was bubbling so violently, and that’s the excess carbon dioxide released during active fermentation. 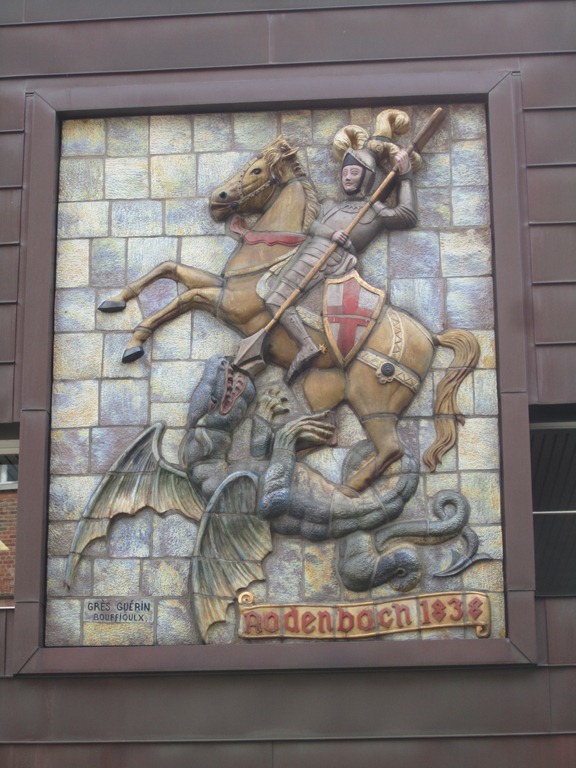 After our unexpected and impromptu mini tour of Rodenbach, we rode back into the city center to grab a beer and some lunch. 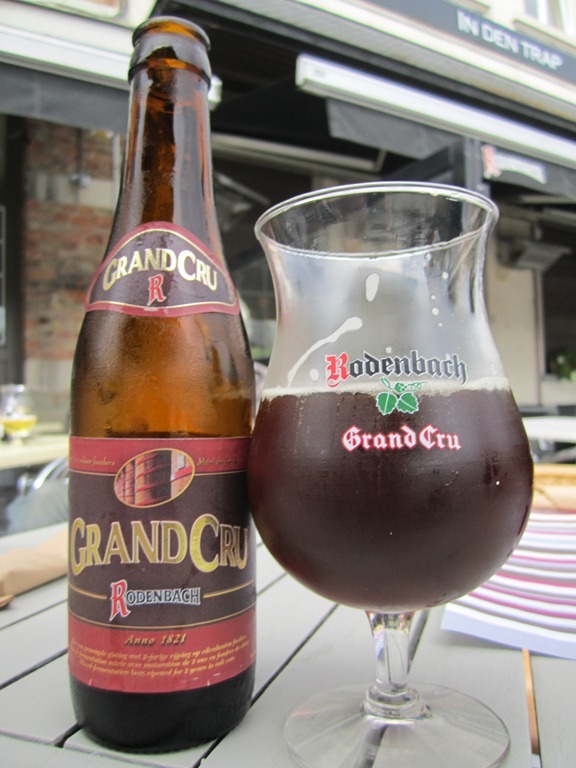 Of course Rodenbach was available on the menu and I got the Grand Cru at 6% abv. The Grand Cru is a Flemish Red Ale, which means its going to be a sour ale. Apple cider vinegar, slightly tart, woody, oak. 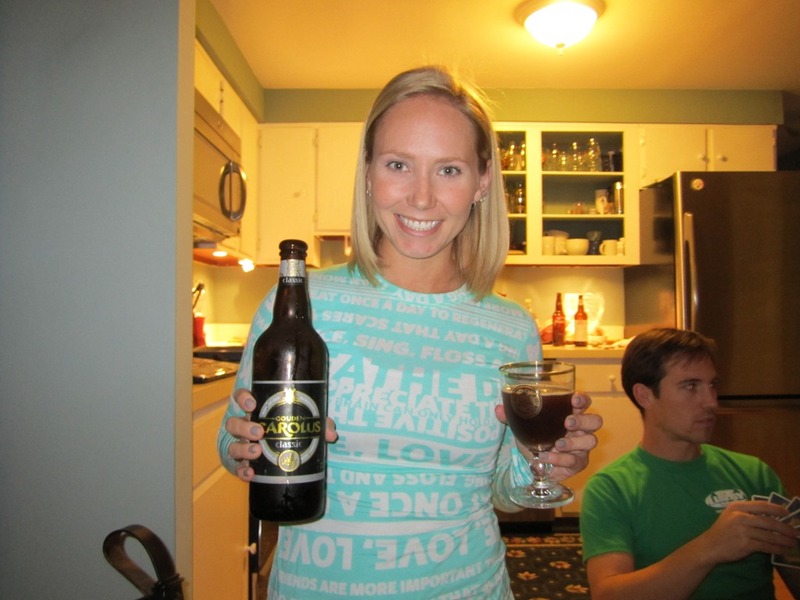 I think the Grand Cru is their best beer, really nice representation of the style. Another funny food story, the menu was all in Flemish, but I knew I was ordering waffles, I just didn’t know what they would have on them. So I just pointed and guessed, thinking that it would be some combination of whipped cream, bananas, or strawberries. Which all seemed to be the standard toppings. When they brought out the waffles, they also gave me a tiny pitcher of very viscous yellow liquid. I assumed that it would be wonderful and drenched my waffles in it. The guy at the table next to ours must have heard me ask Jack what they heck it was, so he leaned in and told me it was egg yolks and liquor. I was pleased that I guess-ordered such a wonderful new topping! 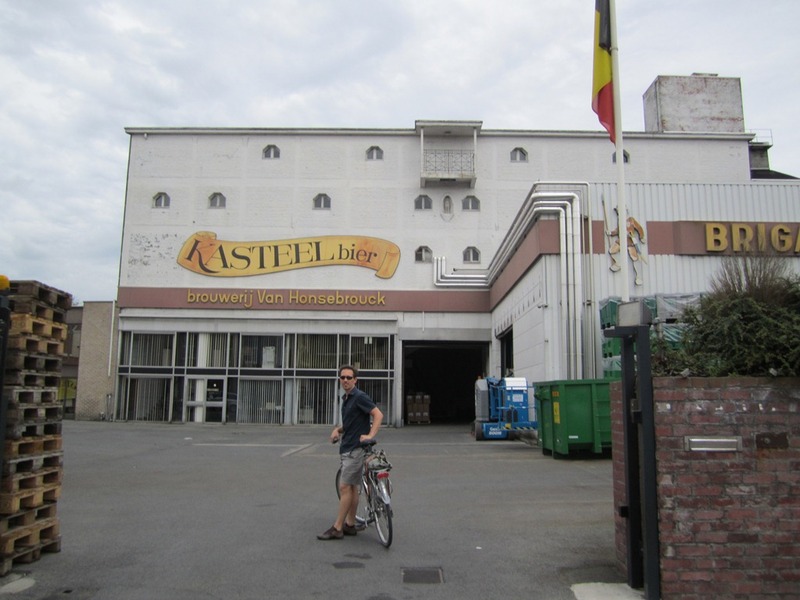 We hopped back on the bikes and took a nice ride down the canal to Inglemunster to visit Kasteel. When we got there we couldn’t really find the visitors’ office. But we heard voices coming from an office down the hall, so we walked down to ask about tours. We accidentally walked into the managers office and he mistook Jack for a distributer that was supposed to be visiting! But once I walked into the room he knew we weren’t the distributors. After telling us they aren’t doing tours because they plan to move the brewery site in two years, he invited us to stay and join him for a drink anyway! 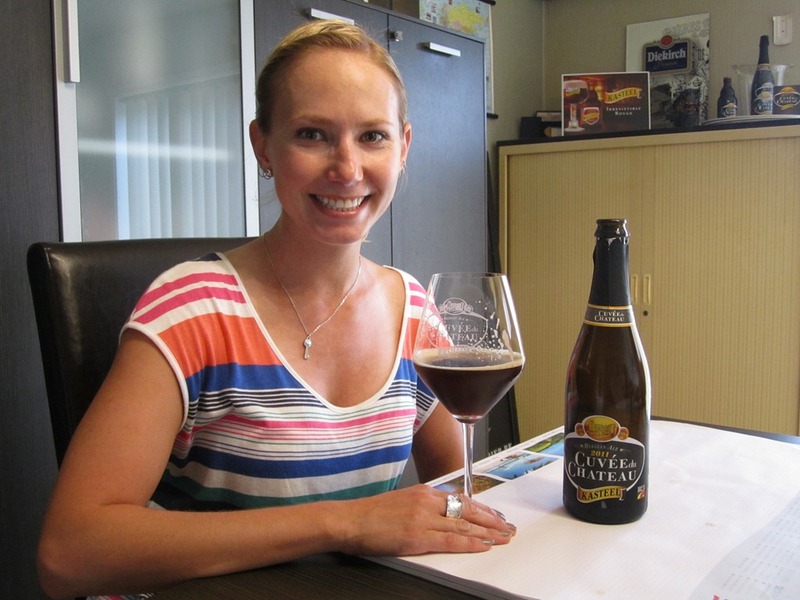 He was only having a Redbull, but he called down to his secretary and had her bring us up the Kasteel Cuvee du Chateau at 11% abv. 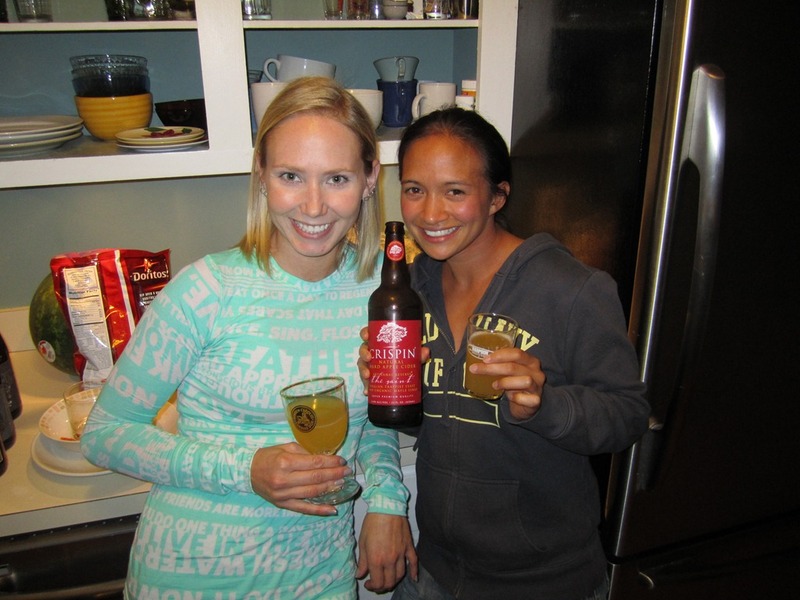 It was so nice to get to chat with a Belgian! 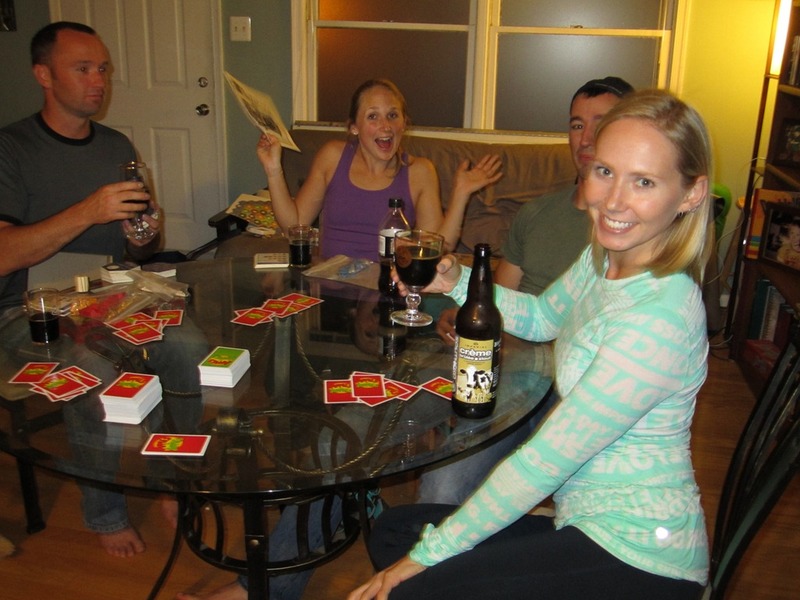 He discussed their move, their beers, their history. And then he turned the discussion to American politics and health care! I was truly surprised to find out how well informed the Belgian people are with American news! He also discussed the other beers they produce there and again called down to his secretary and had her bring up one of everything for us to try! 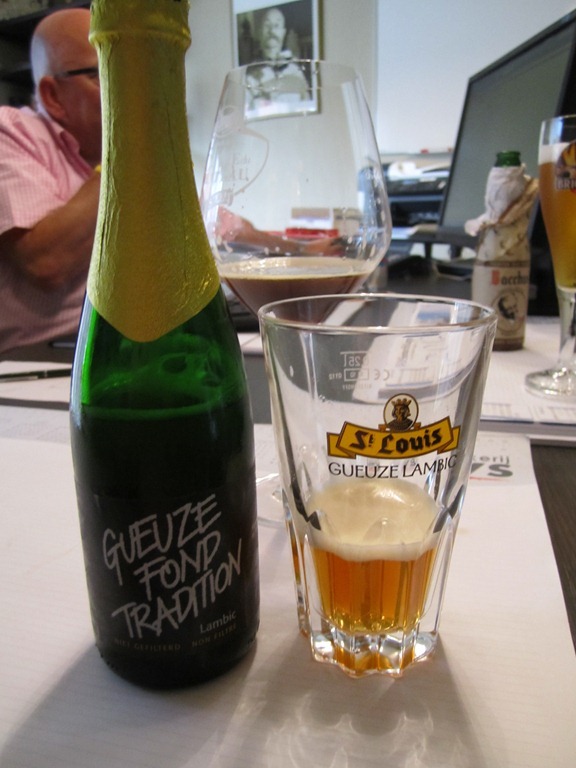 We also had the St Louis Gueuze Fond Tradition at 5% abv. I’ve had this only once before in DC at Brasserie Beck and it was amazing! 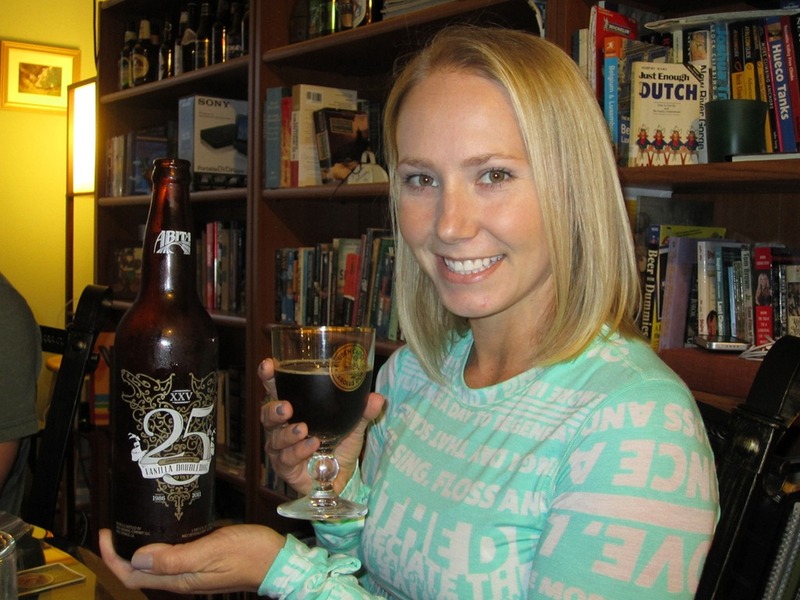 We also tried the Brigand which I think is a very easy drinking beer, but somewhat common. Although, it is one of their best selling and most competitive beer. 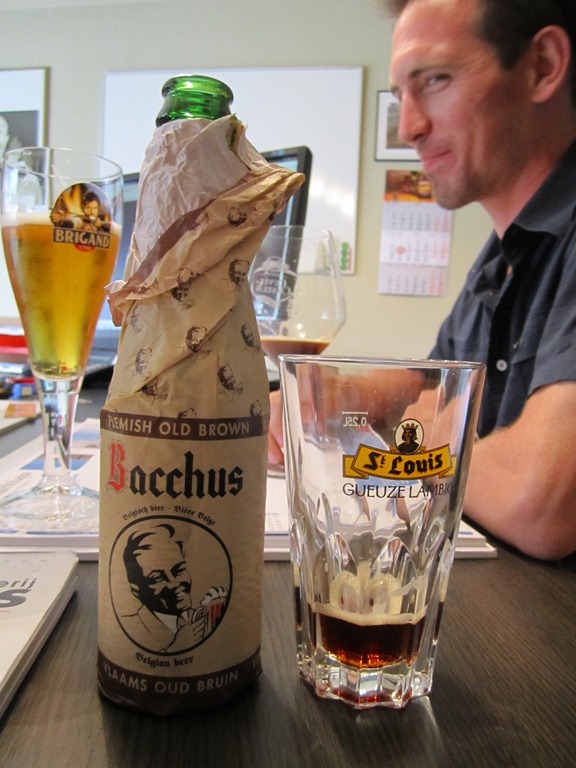 And we had the Bacchus, an Oud Bruin, which was also a sour beer. When we were leaving, I know we took up most of his afternoon, he insisted on giving us beer to take with us. Unfortunately on bikes and traveling we just couldn’t take any bottles. So he ended up giving us six Kasteel glasses, a Kasteel platter, Kasteel aprons, and Kasteel bar runners. We were loaded! He even walked us to our bikes and helped us secure our things. So, thank you very much Phillipe! 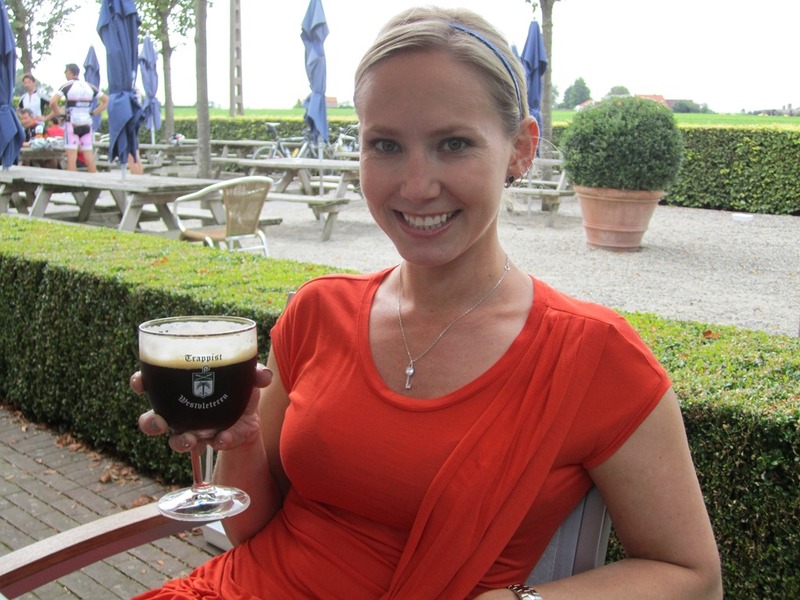 The visit to Kasteel was wonderful and unforgettable. Although, the bike ride home after all those beers was quite a challenge! 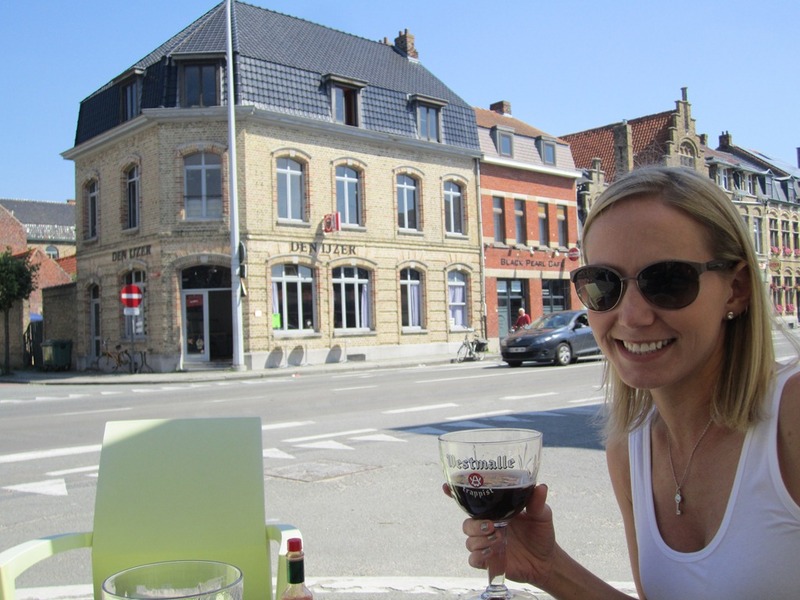 We eventually managed to make it back to Roeselare to sober up a little and find some dinner! The next morning, we woke up ready for another day on the bike! This time we took the road heading out of the opposite end of town and explored an entire new area. After about 12 miles on the road, we found Abbey De St. Sixtus which is best known for brewing the Trappist Westvleteren 6, 8 and 12 beers. The bottles are fairly unremarkable and have no labels, only caps to let you know what you’re drinking. The abbey does not have tours, but there is a beautiful new restaurant at the abbey gates for people wanting to try the hard-to-get beers. 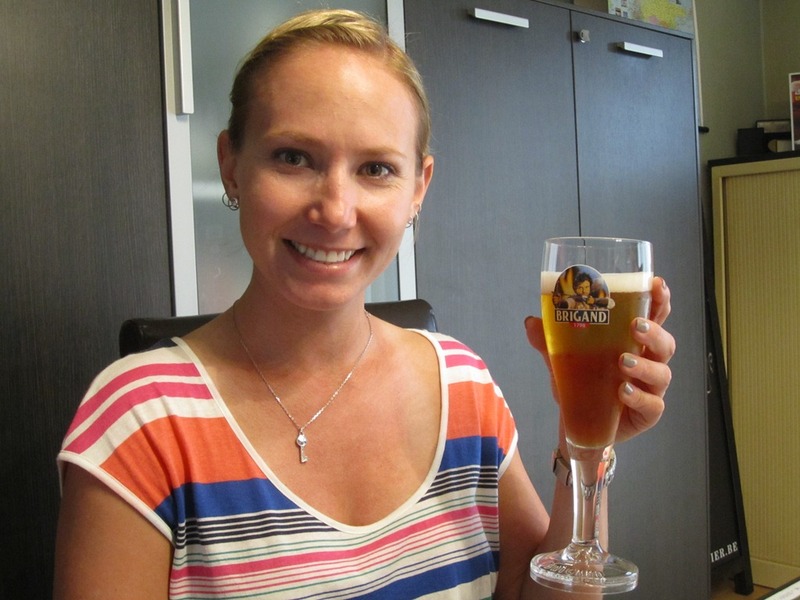 I have never seen this beer available in the States, and not only that but you cant get it anywhere else in Belgium. Only at the abbey café. 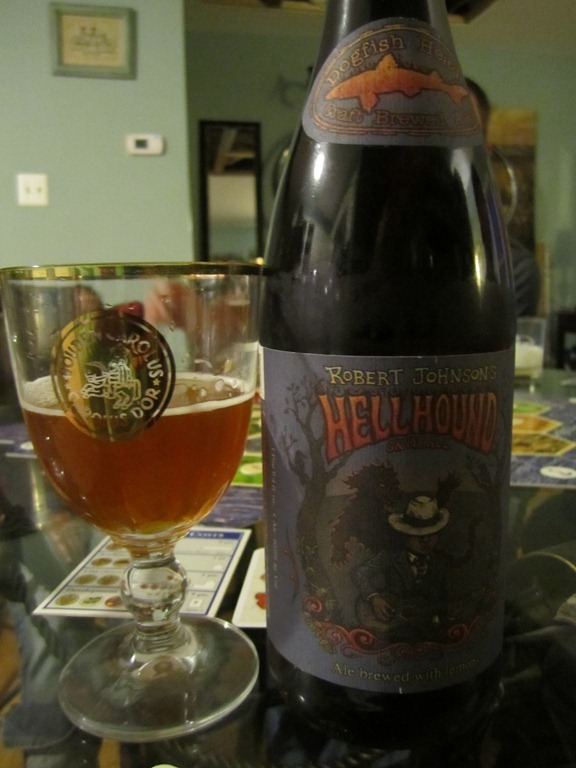 Needless to say, I was DYING to taste this nearly mythical beer! I got the 12 and Jack tried the 8. A very flavorful and complex beer. Candied fruits, molasses, rum and raisins, caramel, figs and dates, alcohol is slightly present, a little boozy. A few sips in, the lacing on the sides of the glass was beautiful. Once we finished out beers, we walked around a bit and we had enough time to hop back on the bikes and see if we could make it to another brewery that day. 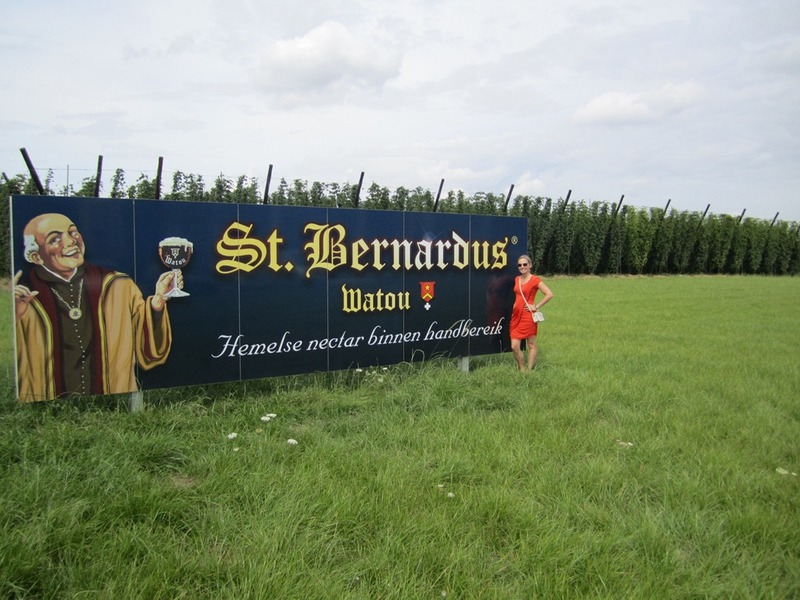 St Bernardus was located only a few miles down the road! 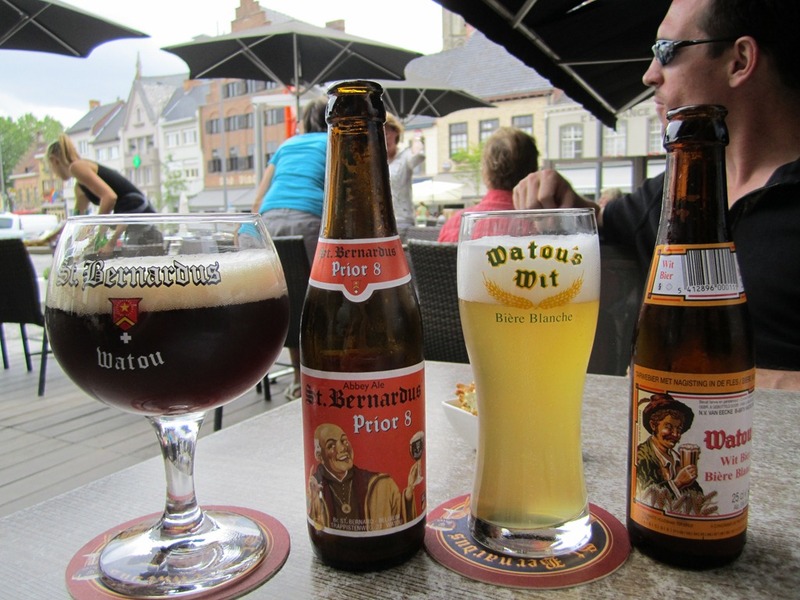 Now here’s a funny fact, St Bernardus used to brew the beer for St Sixtus. They both have identical recipes for the 12. They both use the same hops and both have the same water source. 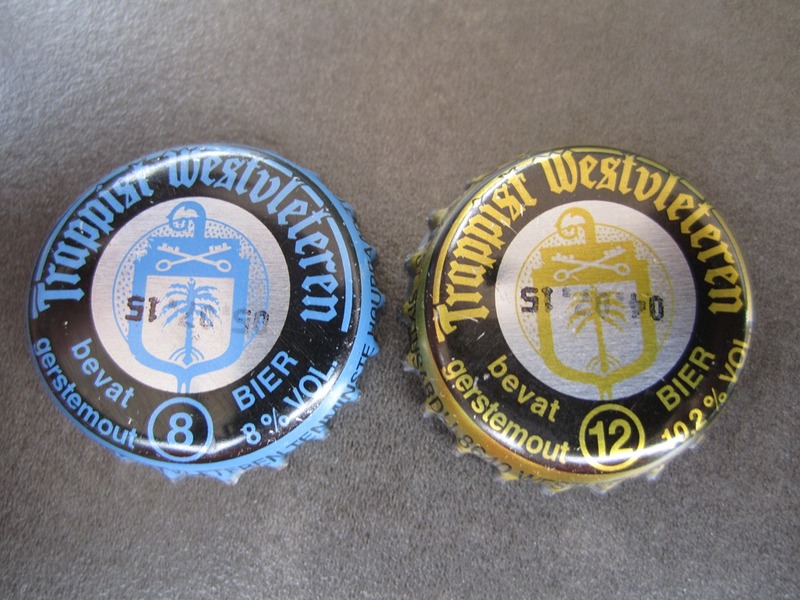 (And actually St Bernardus still uses the original yeast that St Sixtus used to use before St Sixtus switched to the same yeast that Westmalle now uses) So why is the Westvleteren 12 rated one of the best beers in the world? 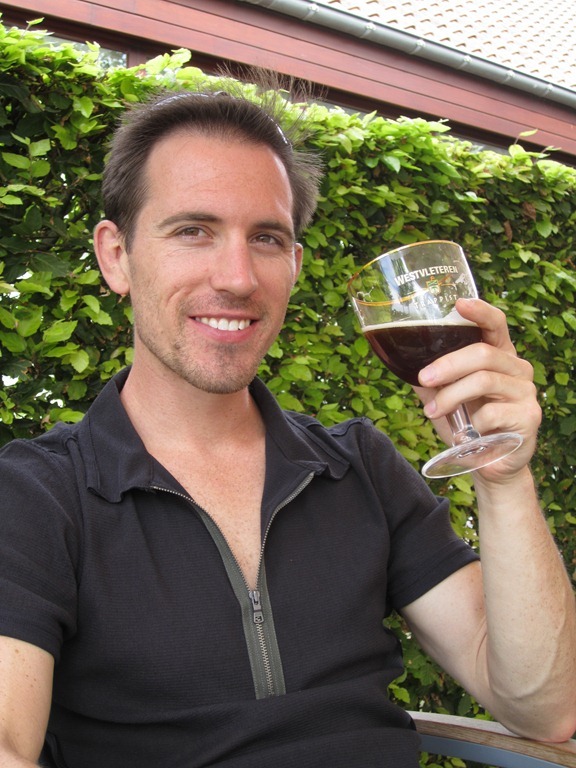 Tim Webb who wrote Good Beer Guide Belgium (my bible while I was there) seems to think its all hype, and its only considered better because beer snobs seem to think that anything hard to obtain is better. So who knows? 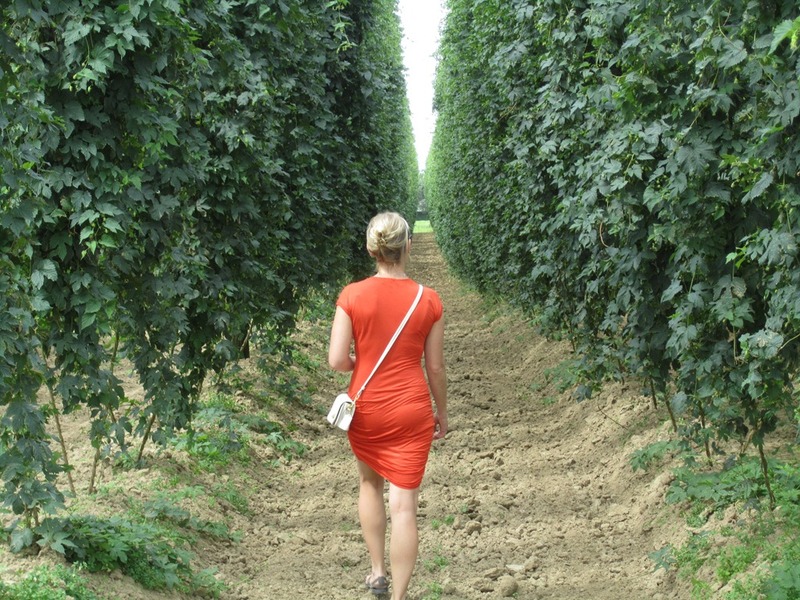 Anyway while at St Bernardus we were able to take a tour of their hop fields! 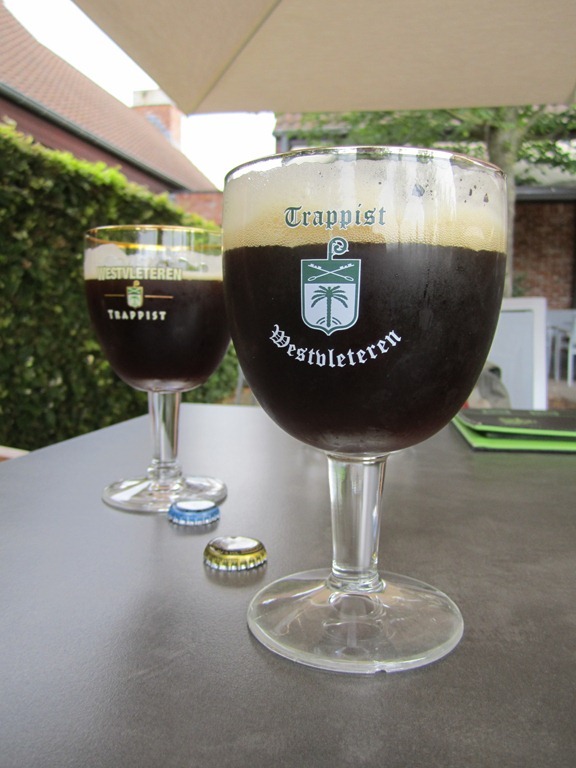 Unfortunately, they weren’t giving brewery tours that day, but we popped into the nearby town of Poperinge and found their beers at a local café. Jack tried a beer from Van Ecke Brewery, also only a few miles away while I got the St Bernardus 8. I chose the Prior 8 because it was only 8% abv and I knew we still had quite a bike ride to get home. Lot of malts, lightly spices, dark fruits, figs and pears, sweet and almost nutty. For dinner I ordered the crepes. We were less than 10 miles from the French border at this point and the waitress looked at me like I was crazy. Crepes were on the menu. Crepes! So they brought over the English speaking waitress. I tried to order crepes. Ah, she says, pannekoeken! I just couldn’t believe that we live thousands of miles away from France and know what crepes are, but 10 miles from the border that are called Pannekoeken. I also learned that whipped cream is slagroom in Flemmish. It sounds unappetizing, but my pannekoeken and slagroom were delicious! The next morning, we rented bikes from the couple running the B&B; I was surprised when they lent us their own two bikes! They were large commuter bikes, but they were nice. The were like the Lexus SUV of bicycles. 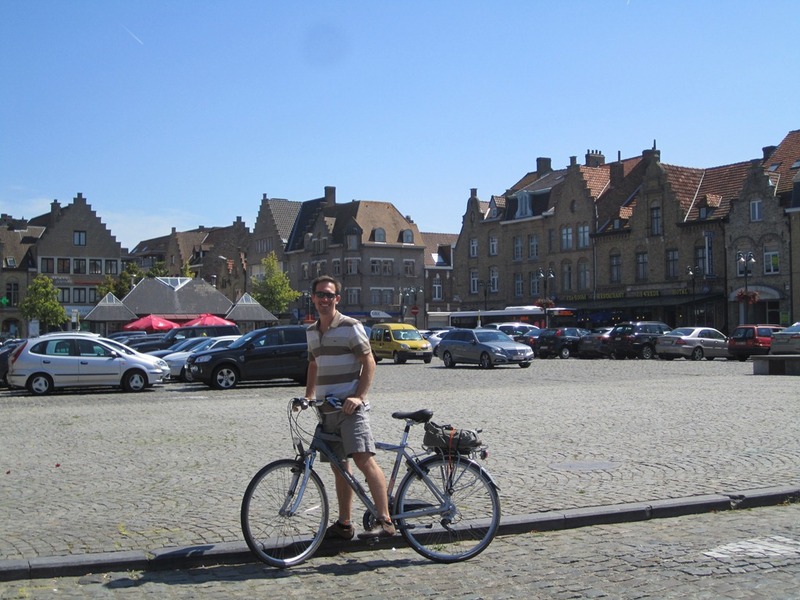 We rode about 13 miles to another small town, Diksmuide and had lunch. 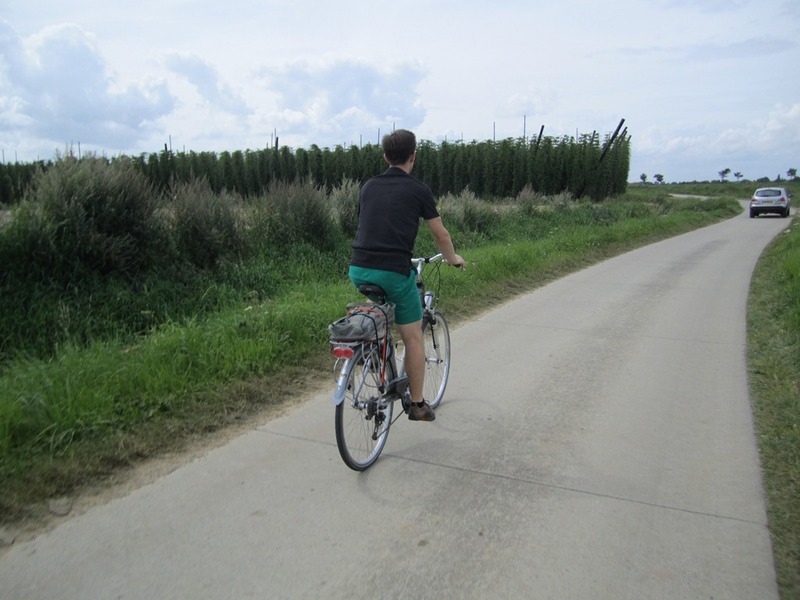 Biking in Belgium was fantastic! There were bike lanes everywhere and cars always gave you the right of way. It felt very safe. The other nice thing was, that the small towns are so close that it only takes 10-15 minutes to get to the next one. So the bike ride went fast! 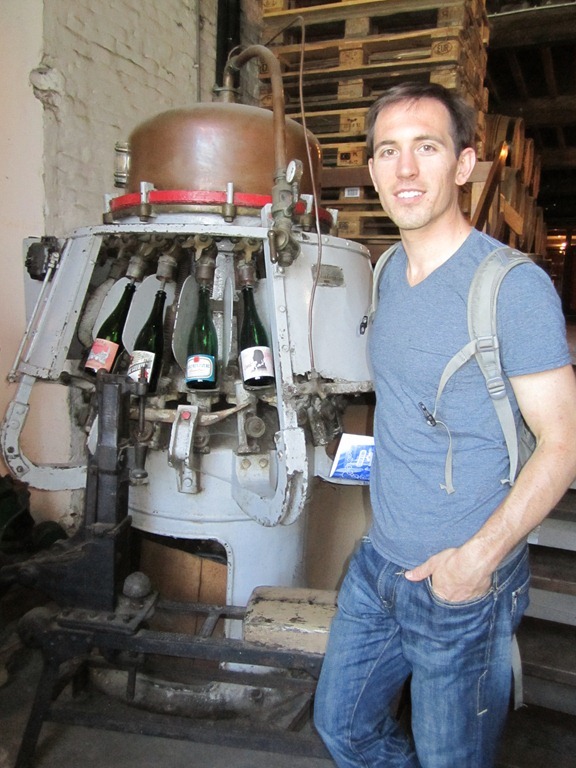 After lunch, we biked two miles to Esen to go to the De Dolle Brewery! 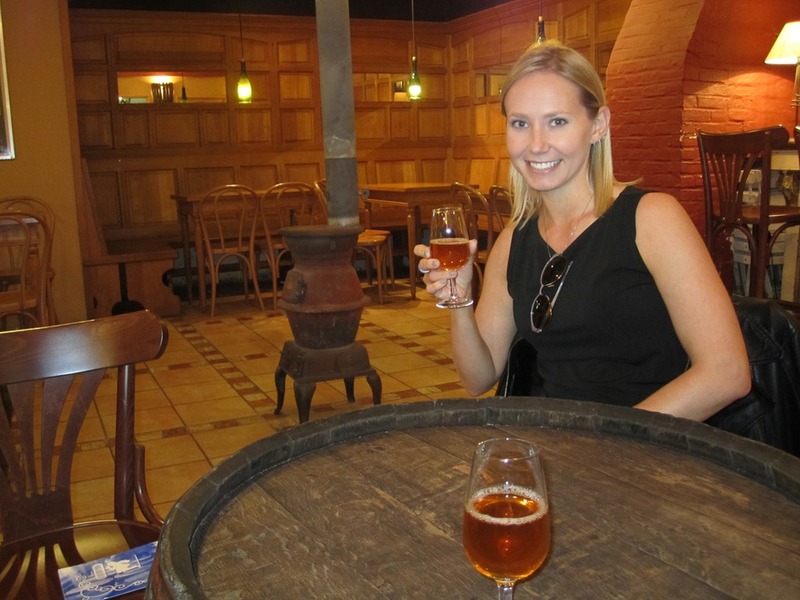 The building dates from 1835 and was originally owned by a doctor who also brewed beer! 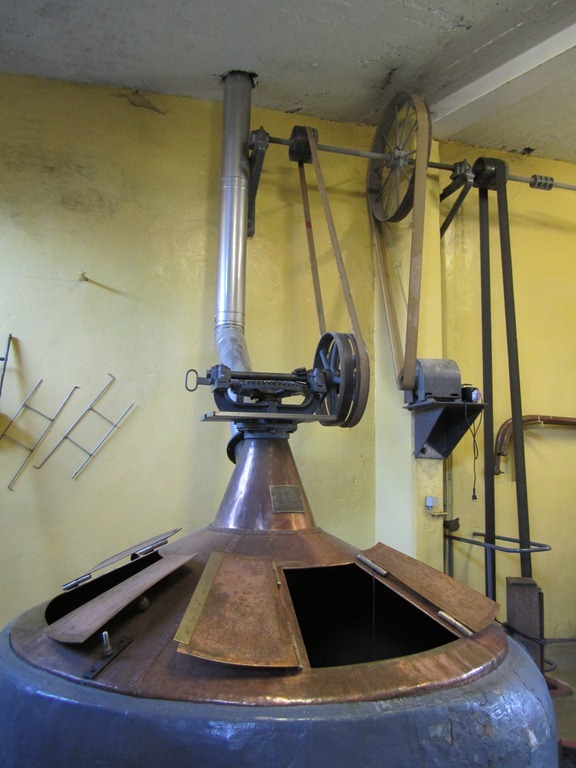 The De Dolle brewery dates from 1980 although much of the equipment is much older. The tour was amazing! The master brewer, Chris, ended up giving us the tour because his mom, who is in her 80s, wasn’t feeling up to it that day. It was so exciting to get the tour from the master brewer! 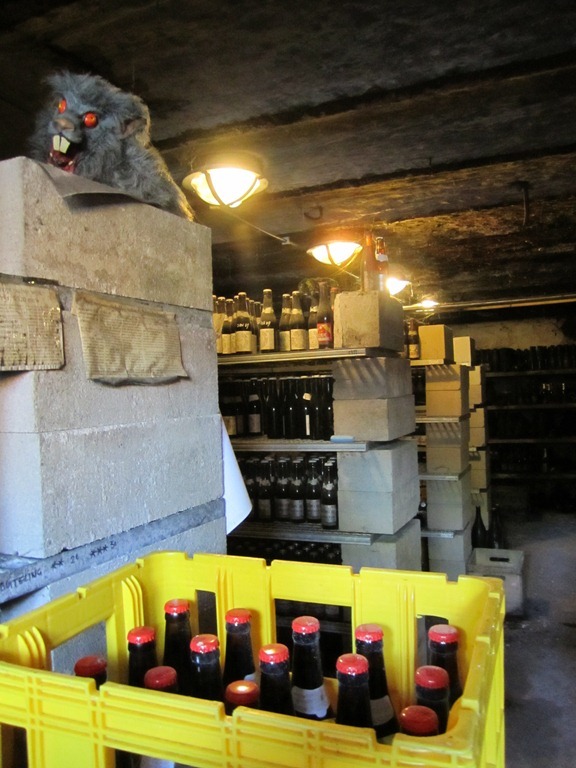 The De Dolle personal cellar. I cant even imagine how good the beer is in there! We finally got to the cellar! It was pretty cold and damp! I was fascinated with how Chris poured us a sample! Its similar to a straw when you put your finger over the end it traps the liquid until you let it go! But he only poured the sample into one glass and all five of us on the tour had to share the same glass! Everyone was nice enough to let the lady go first! Thank goodness! And to clean the glass, he rinsed it and wiped it on his shirt. They are so casual about those things in Belgium it seems. Somehow I don’t think that would fly in the US. 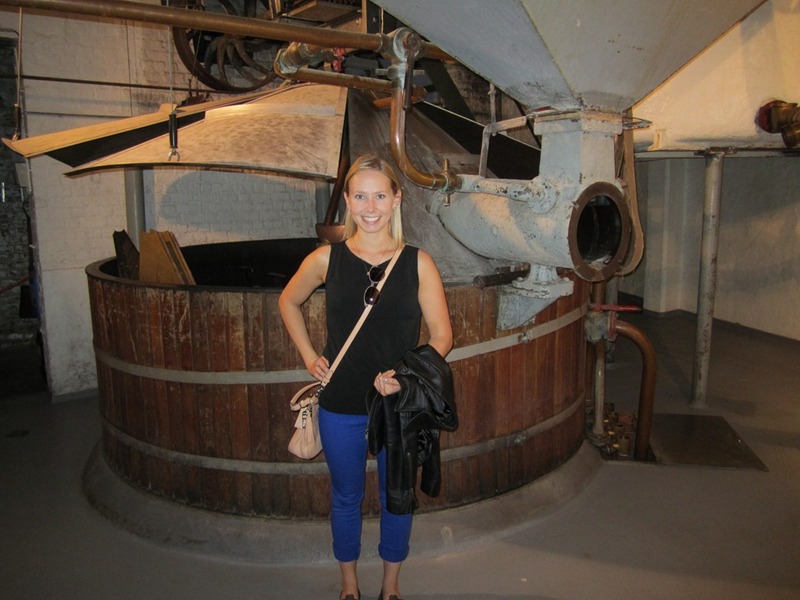 After the tour, we headed back upstairs into the tasting room! I finally got to try their Extra Export Stout at 9% abv. 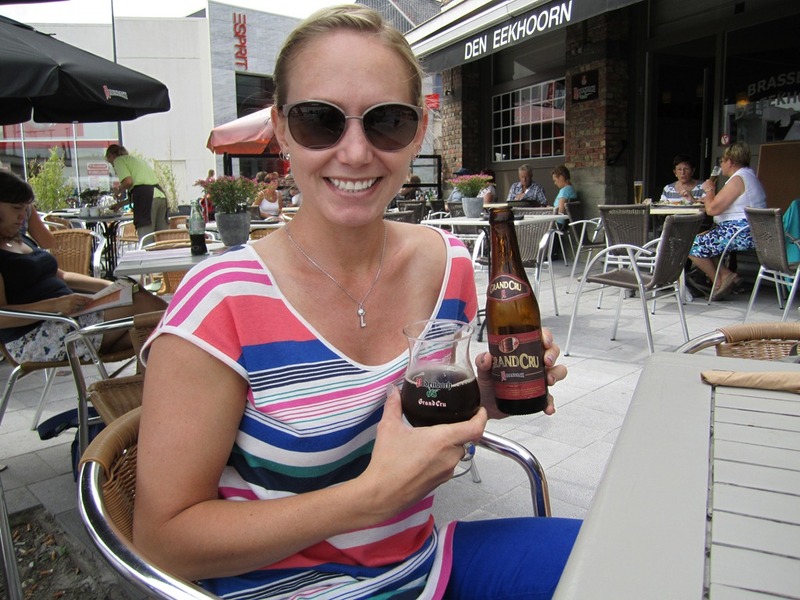 I rarely find this beer on menus in the States and when I try to order it that are always out! Still more Belgian than a regular stout. Raisins, toffee, dark chocolate, Belgian yeastiness! 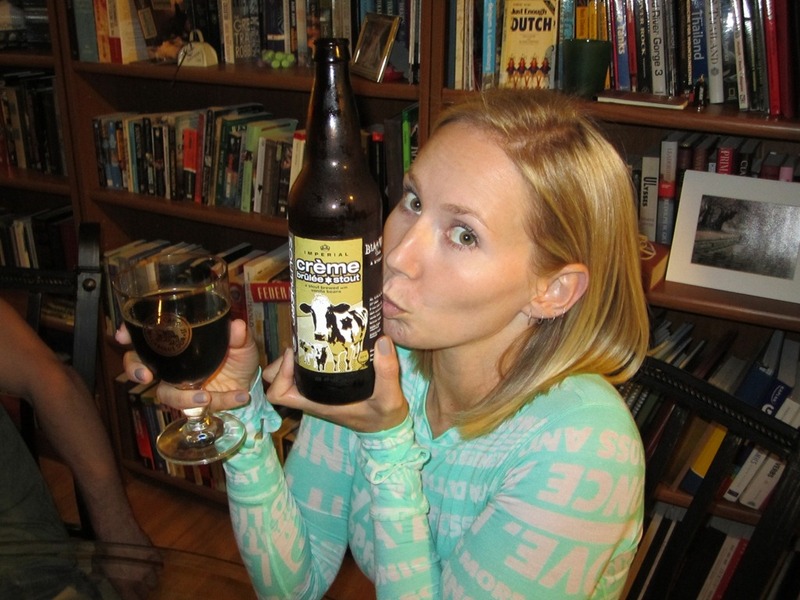 Exactly what I’m looking for in a stout! Also had the Arabier at 8% abv. Citrus and orange peels, candy sugar, pears, rich and full mouthfeel but not too heavy. 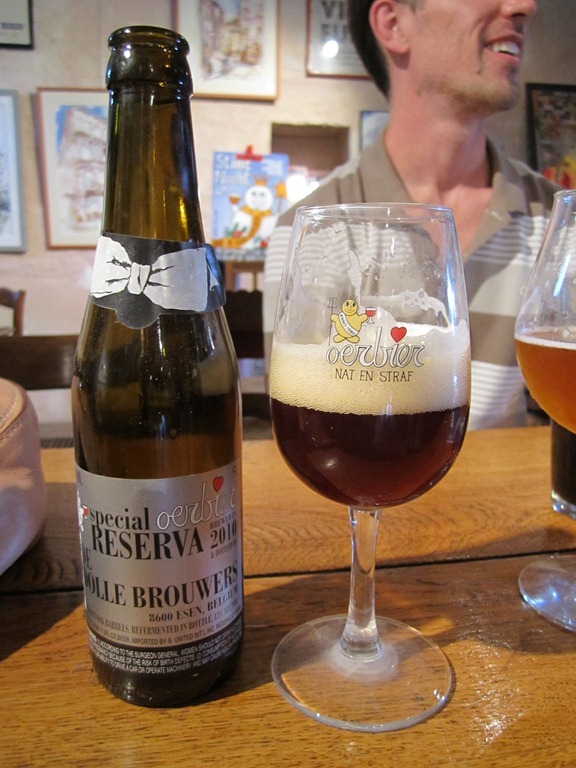 While we sat around, enjoying our beers, Chris brought out the Special Oerbier Reserva 2009 13% ABV and split it between the people in our tour group. I’ve never had this beer before so I was quite excited! Surprisingly drinkable considering the high alcohol content. Although you can surely taste it. A little more tart, balsamic vinegar, plums and cherries, hints of chocolate and brown sugar, almost more like a fine liquor. A small glass was all we could handle. Too cool! Completely unfiltered, cloudy with yeast. And it was still pretty darn good. 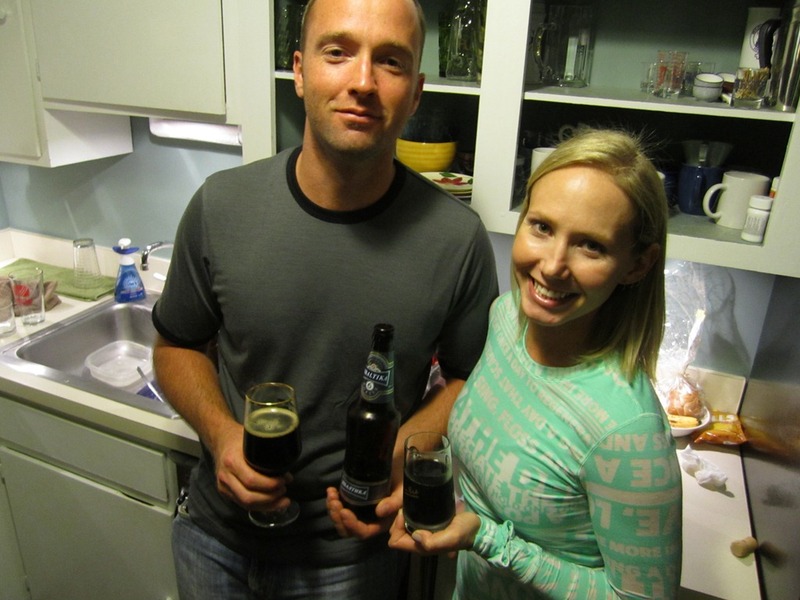 I just find it so amazing that he has such a laid back attitude about beer and that he’s willing to experiment. 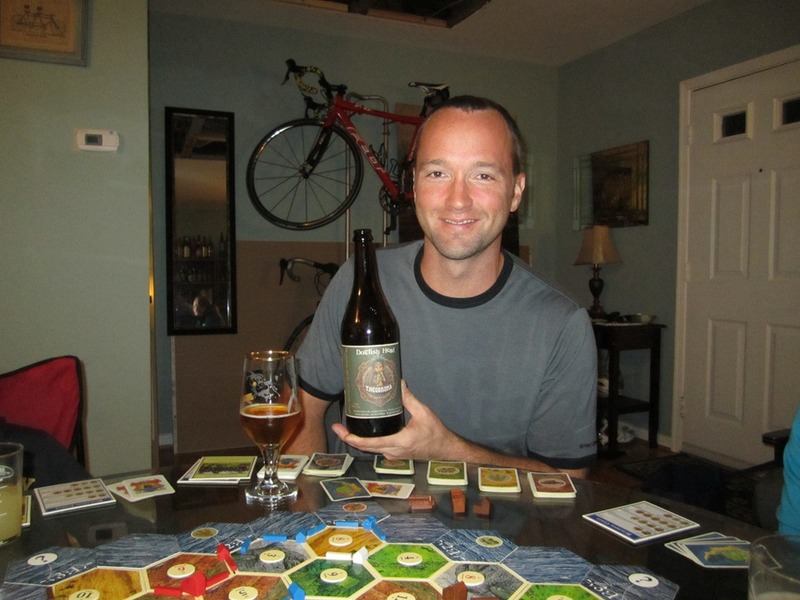 One of my favorite things that he said was that he has a ton of beer that needs bottling, but that he will put it off a little longer since he thinks bottling is such a boring task. Brewing is the fun stuff! After all these beers we reluctantly left the brewery and got back on our bikes. We were a bit tipsy, but we made it the two miles back to Diksmuide and had dinner! 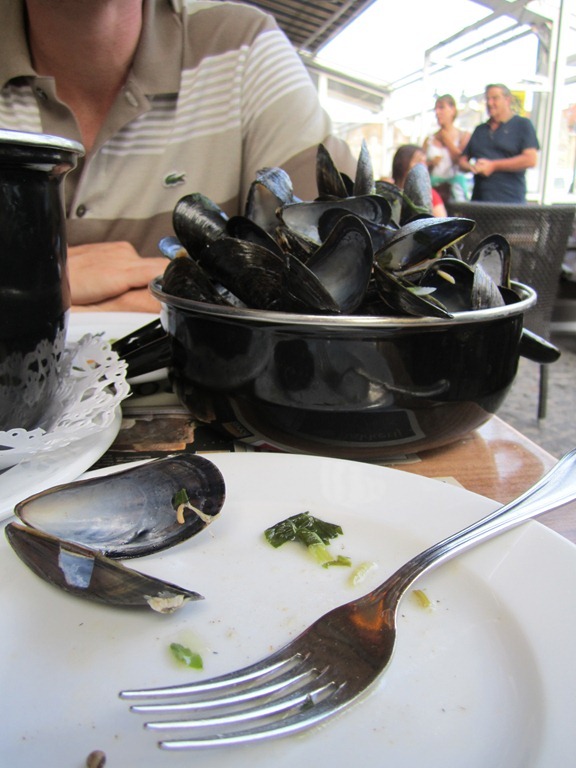 We went with the traditional Belgian fare and got mussels and frites! The second day into our Belgium trip was a travel day, nothing very exciting. 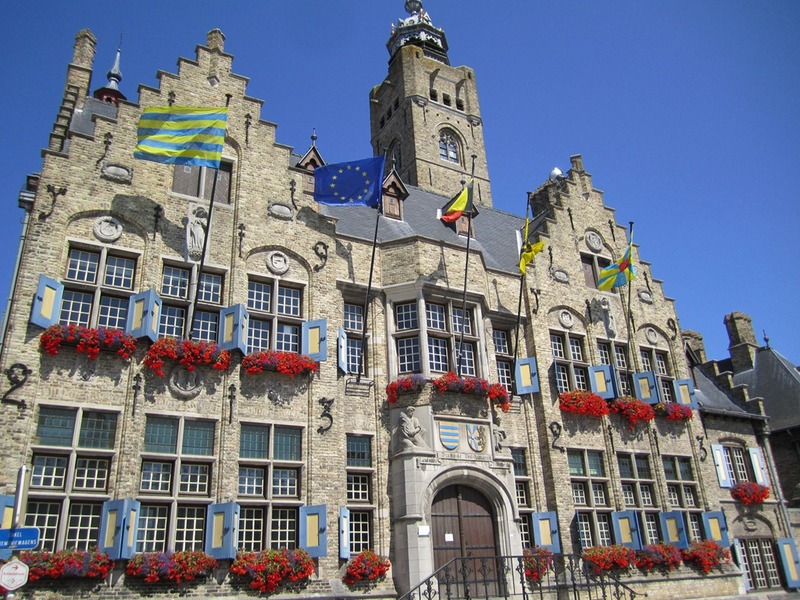 We left Brussels and took the train to Ieper. 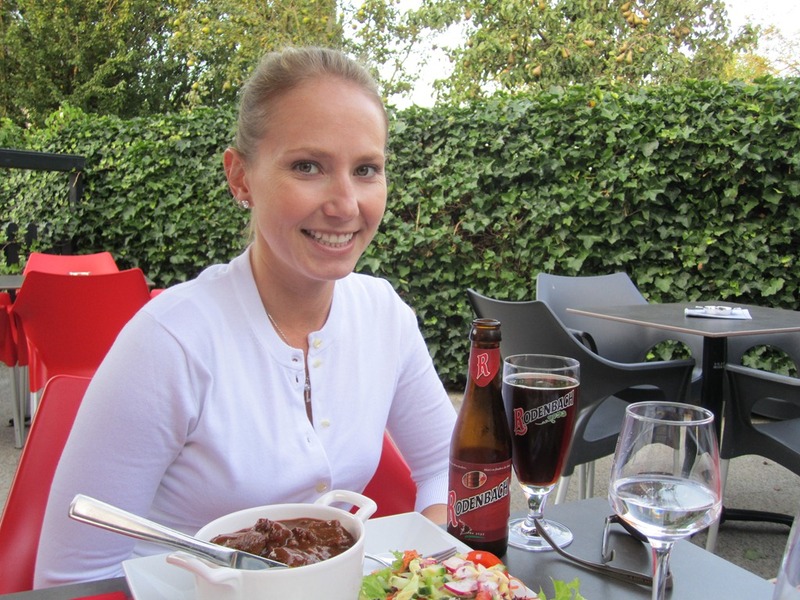 Once in Ieper, we stopped and had lunch and a beer! 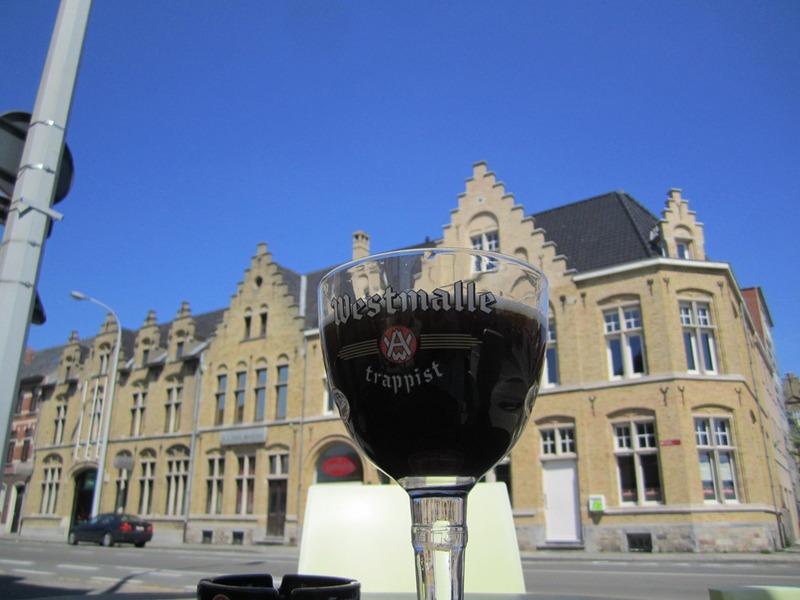 The little bar only had a few beer options, but you cant complain when Westmalle Dubbel is on the menu! The only bar food they offered was spaghetti. I found this odd. I’m glad only Jack ordered because it was the biggest platter of spaghetti I’ve ever seen! It took us both to finish it. From there we took a bus to the very small town we were staying called Poelkapelle. We got great rooms at t’Oude Gemeentehuis which was run by a young couple, Steijn and his wife. We had a great time talking to them and getting to learn about the area and the B&B. For dinner, we decided to walk around and see the town. 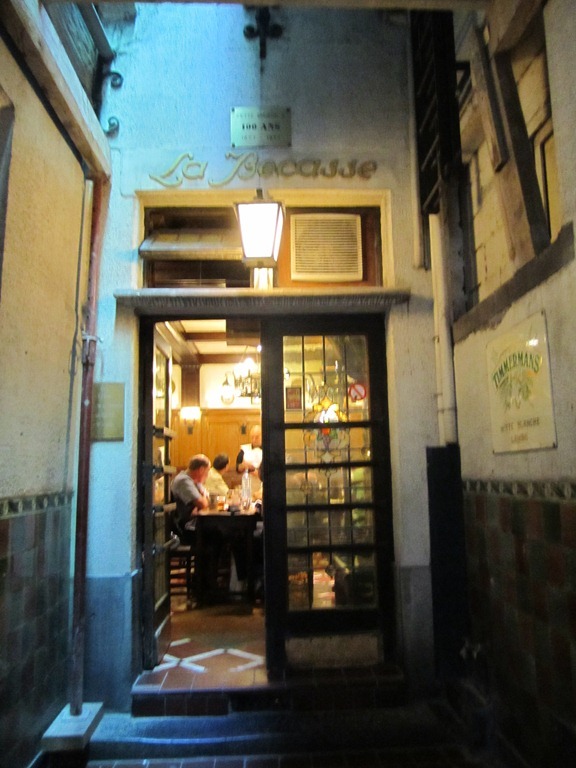 The town was only one main street with very little food offerings, but we found a small café called Point A.
I got a delicious Flemish beef stew and a Rodenbach from Brouwerij Rodenbach in Roeselare, Belgium at 5.2% abv. And we were serenaded throughout dinner by the lambs and goats on the other side of the hedge. 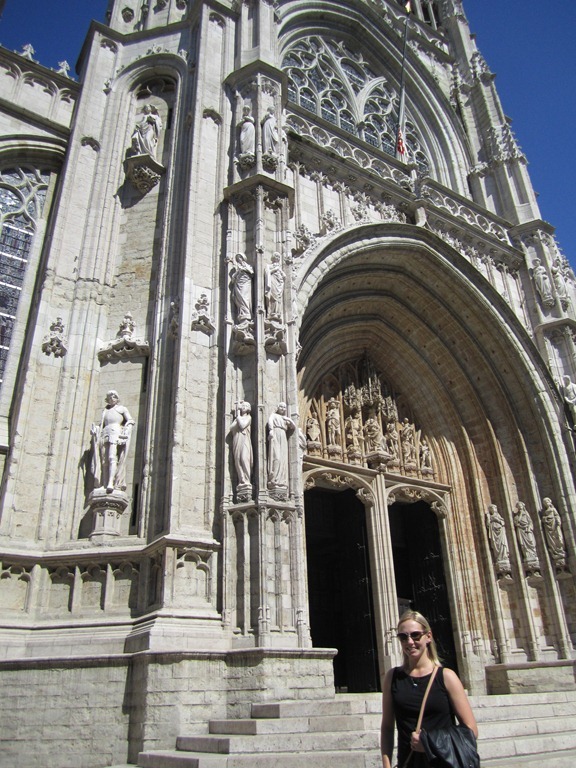 Thursday August 9th, we flew out of Dulles, slept six hours on the plane, and woke up in Belgium at 7am on the 10th. We wandered around Brussels a bit, grabbed a quick breakfast, dropped our bags off at the hotel and began to explore the city. 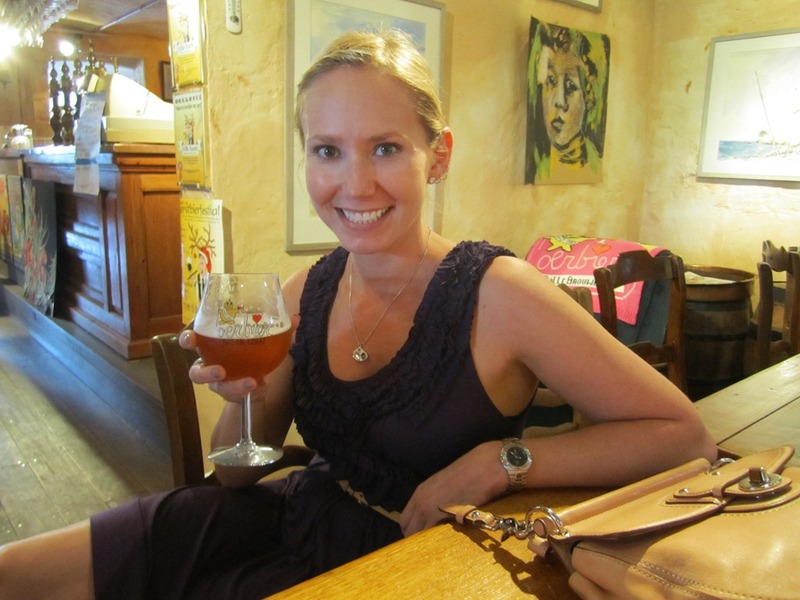 The first stop on our list was Cantillon Brewery. 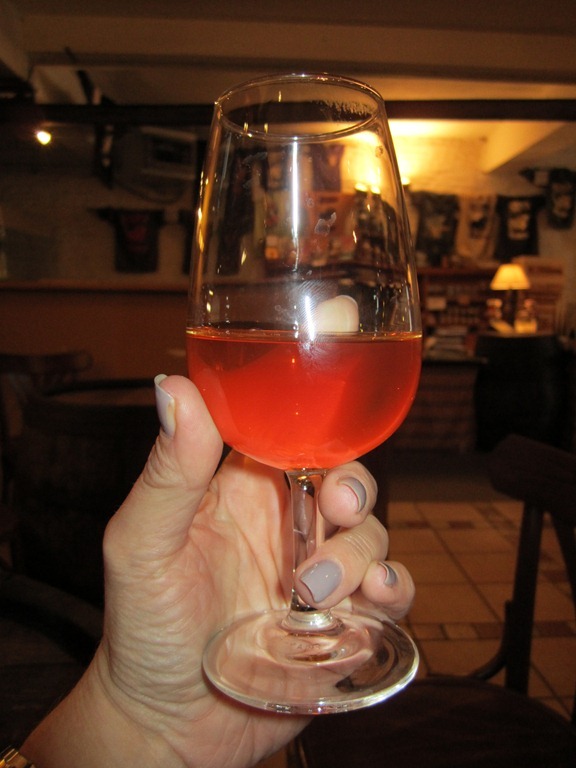 Cantillon makes a special kind of beer called Gueuze. (Pronounced Gooz) Gueuze is a blend of 1 year, 2 year, and 3 year old lambics. 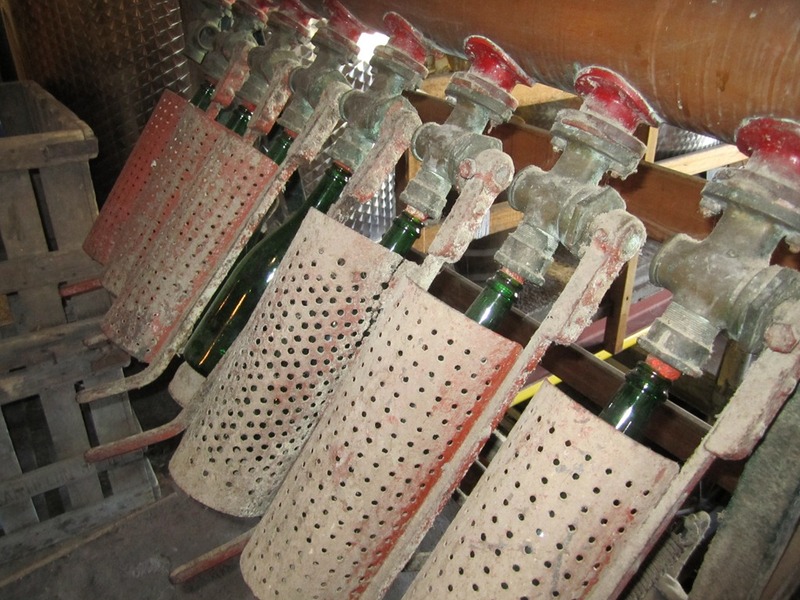 Traditional lambics are spontaneously fermented. 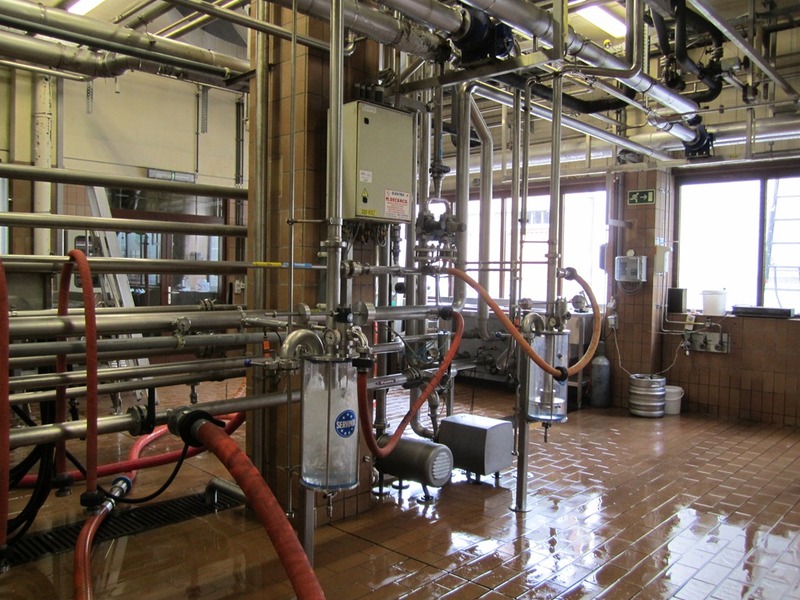 This means that instead of the brewer pitching a specific strain of yeast, the beer is pumped into large, shallow open air containers to allow the yeast and bacteria that is naturally occurring in the air to fall onto the beer and cause fermentation. 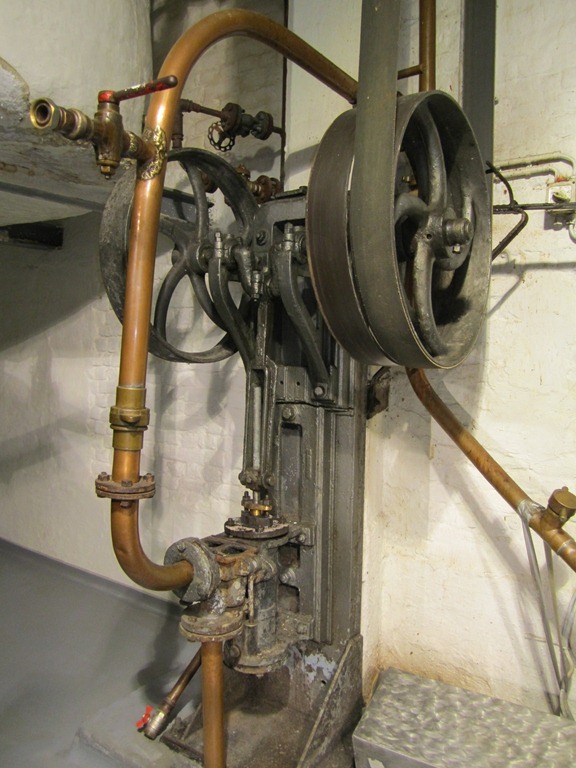 All of the equipment in Cantillon looks like it should be in museum! Yes, this is still in use! 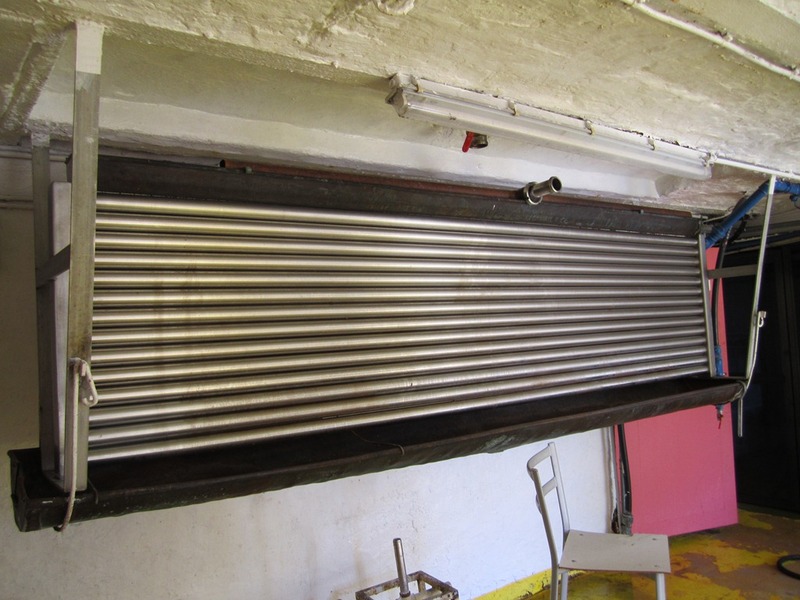 All of their equipment is also belt driven. 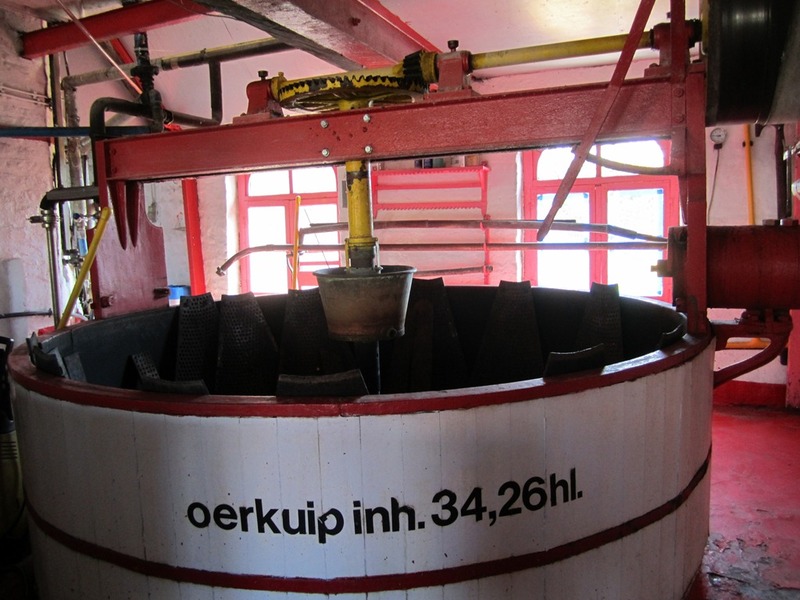 Its amazing to see these ancient kettles and to know that they are still fully functional. Oh yes, and of course the tasting! 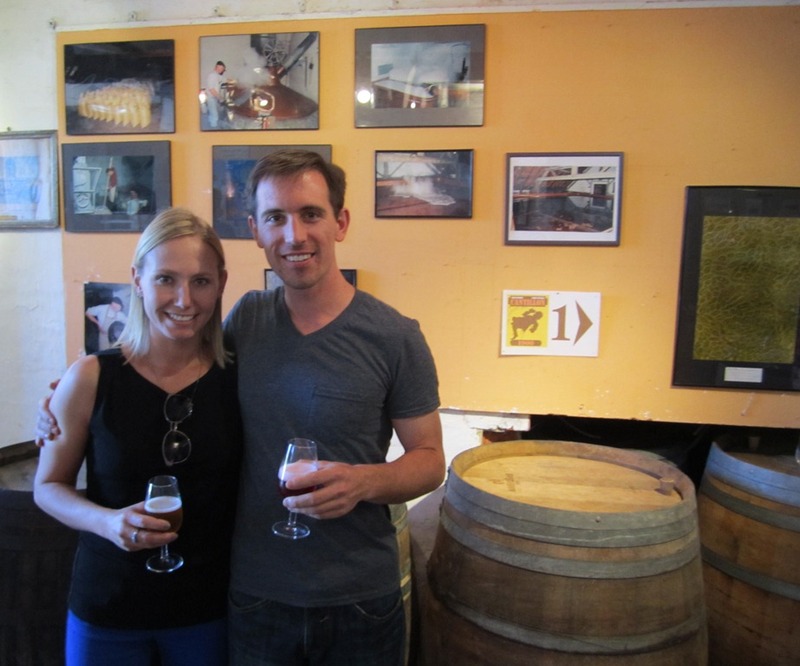 Two beers were included with the tour. 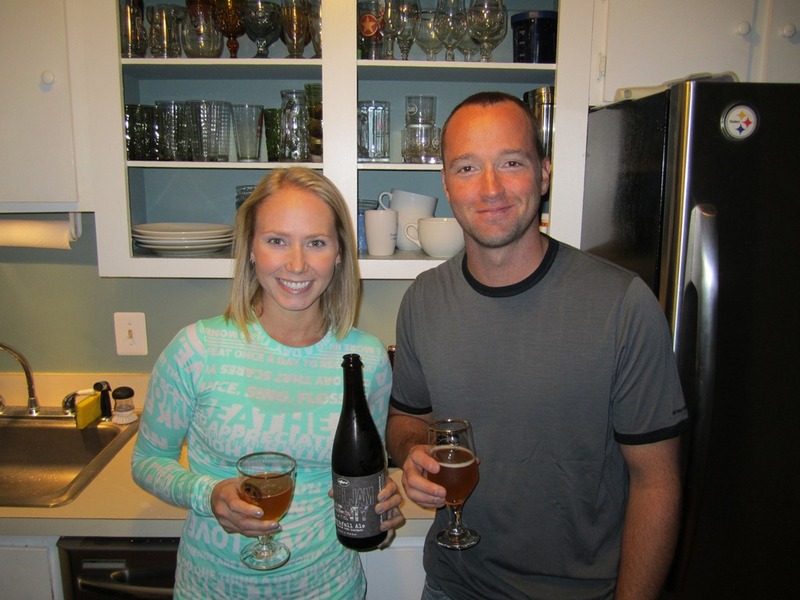 The first beer that was poured was a one year old lambic. Since it was young, it was very tart, tangy, and bitter. Not very complex. Still drinkable. If you weren’t used to the style, it might have been too much for some people. 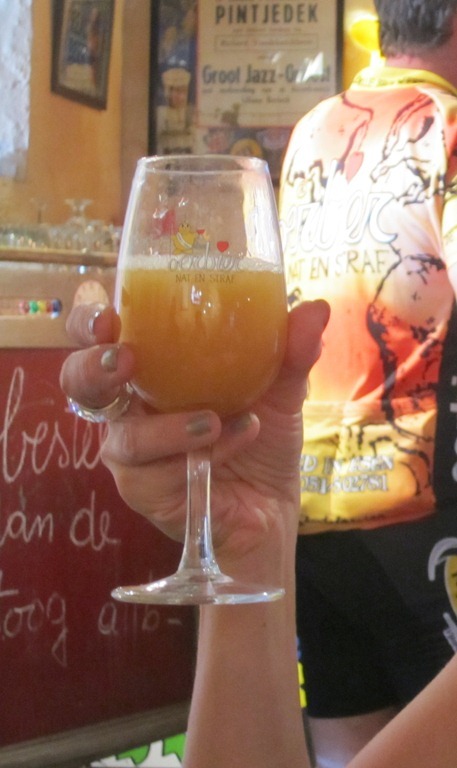 They only have you sample this style so that you can taste the real difference in the gueuze. I cant even describe how amazing it was to be there. 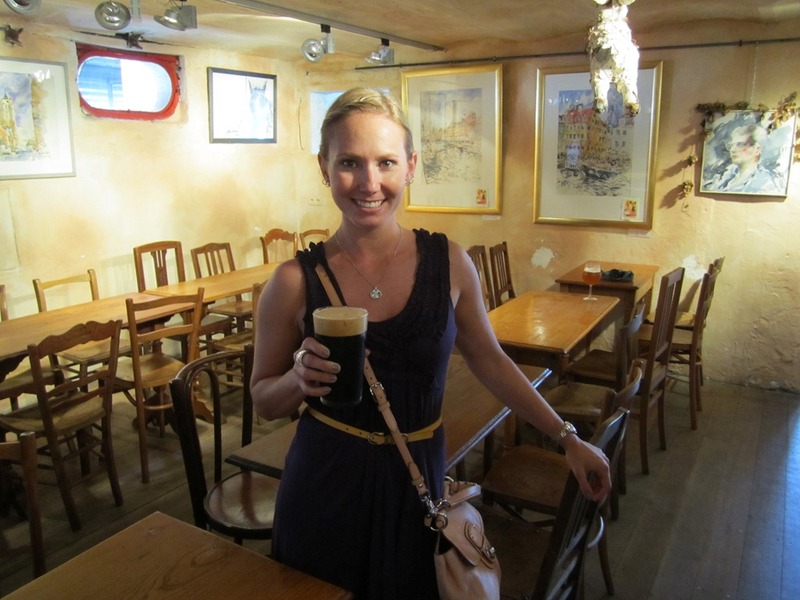 I was overwhelmed that I was actually halfway around the world in a brewery that I only ever dreamed of visiting. 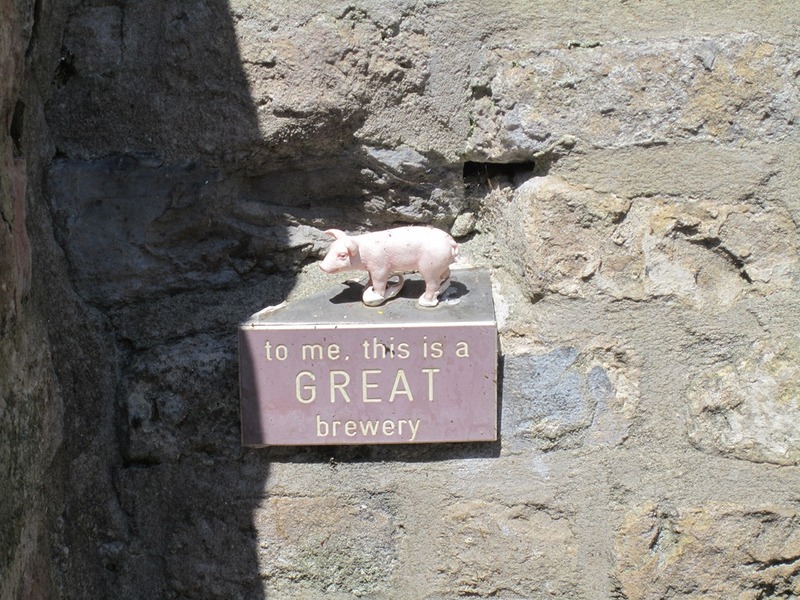 I also thought it was unusual that the brewery has remained in the family, the great-great granddaughter of the founder was working there and giving tours that day. For my second drink I chose the traditional Gueuze. I really wanted to compare it to the previous beer. The first one was not blended, this second one was. It was so different! Much more carbonation (because the yeast had eaten all the sugars and produced carbon dioxide) It was very mellow and drinkable. 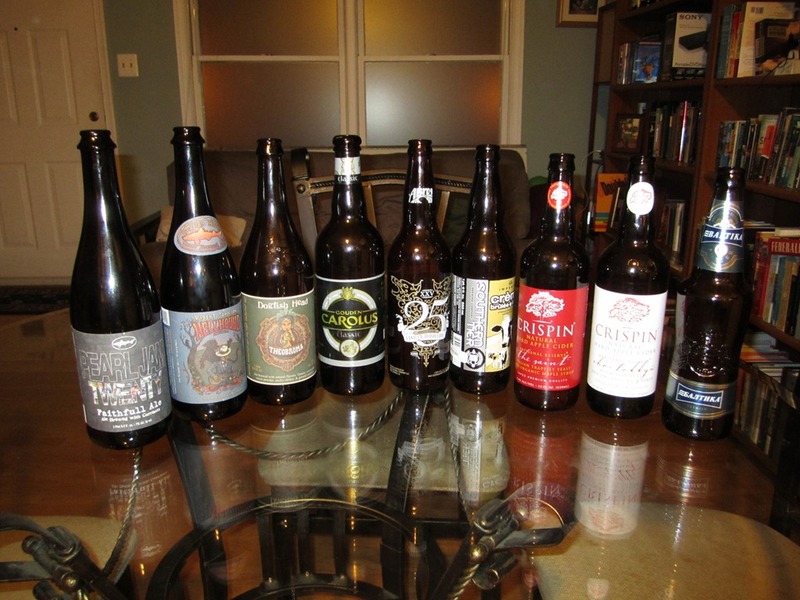 The beer was much more complex and mature. 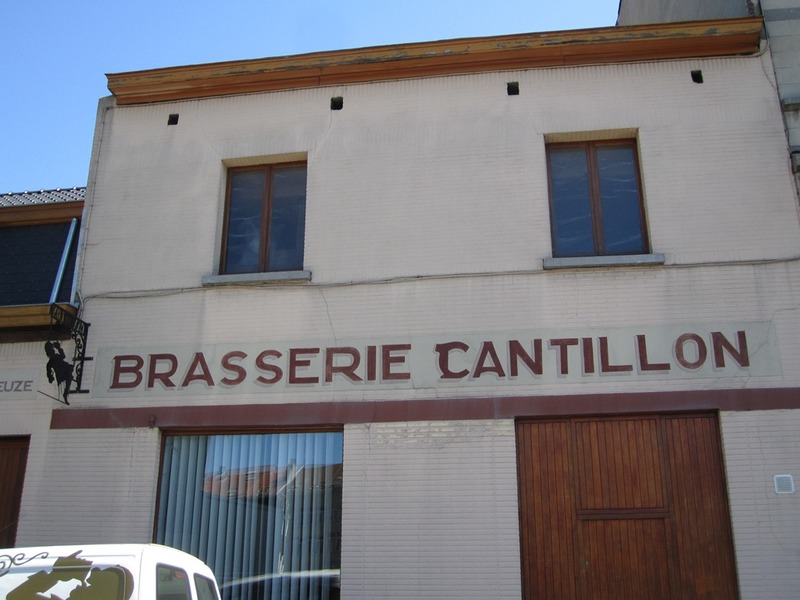 With a slight buzz going, we sadly left Cantillon and headed back into the heart of the city. 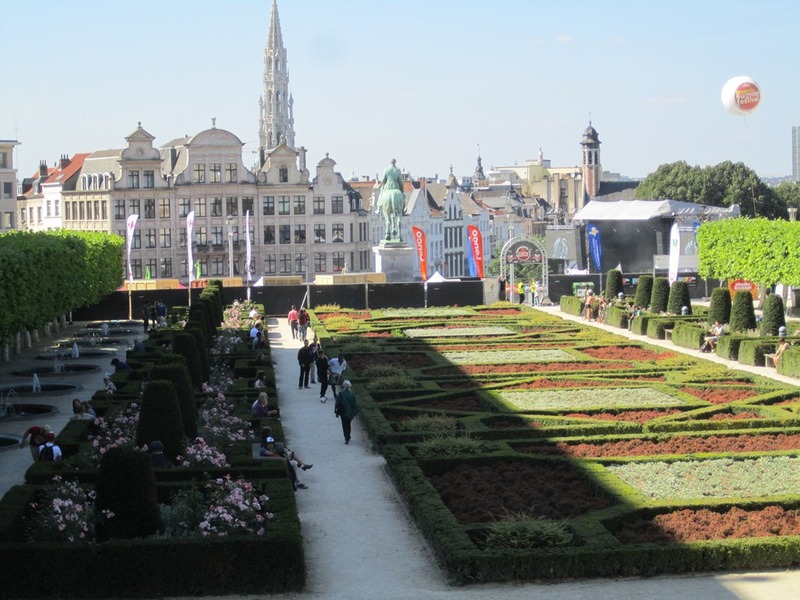 Brussels was beautiful. The streets were clean and well kept, the buildings were in very good shape. We had lunch at one of the many outdoor cafes along the street, and relaxed in the shade. After lunch, feeling refreshed, we walked around town. The church had so much dark wood and marble it was like a tomb. It was nice to be greeted by the sun and sights like this when we emerged. The gardens! I could go on and on about the gardens, they were always relaxing and fun to find and come across on our trip. There was one bar in particular that we were looking for in Brussels. 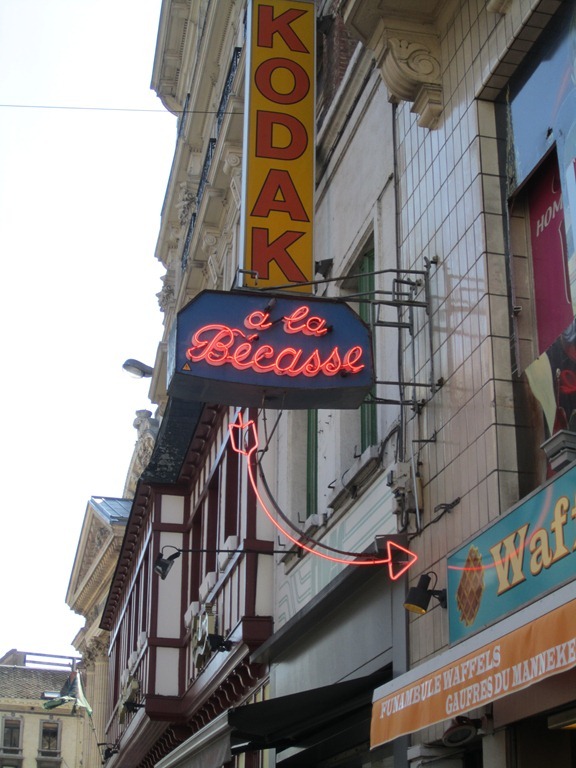 It was called A La Becasse. I read about it in the Beer Connoisseur magazine and it sounded like a much better find than the Delirium Bar. Delirium would have been loud and touristy. Nothing wrong with that, we were just looking for something authentic. Even though the sign is in plain sight, the bar was not. It was so exciting, we walked through a doorway/ alley to finally get back to the bar. The interior of the bar was just as cool, with the wood and tables seeming quite old. 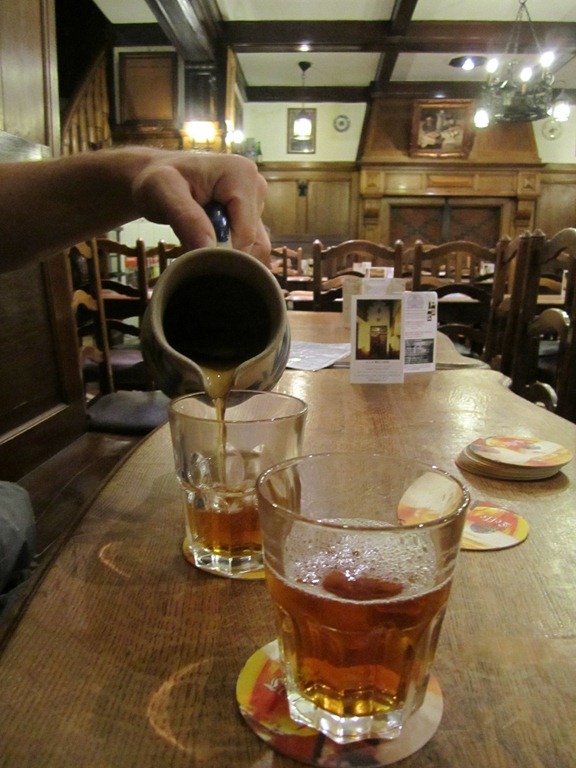 The bar specializes in gueuze served in the traditional manner, out of stone pitchers. 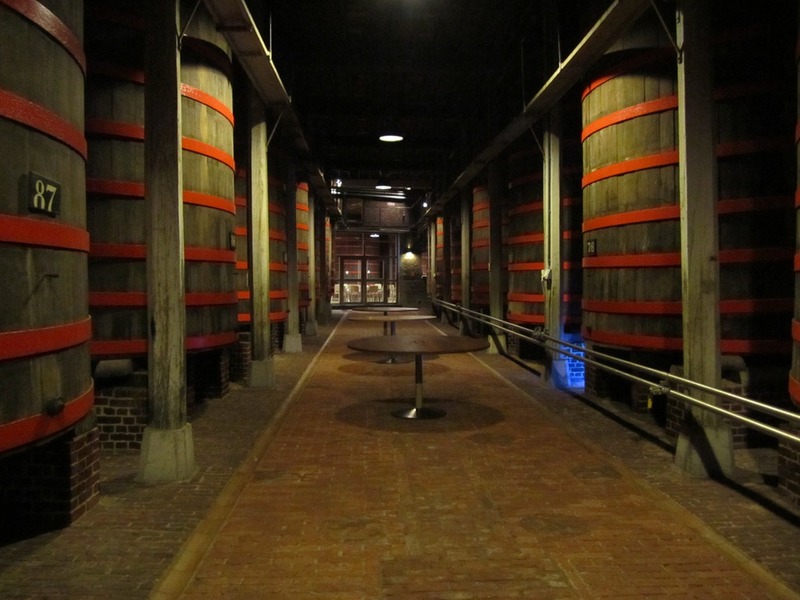 They only carried three or four kinds of beer, all gueuze or lambics. We ordered a pitcher to split of traditional Timmerman’s gueuze. It felt almost secret and intimate. We also had the bar almost to ourselves since we came right before the dinner rush. 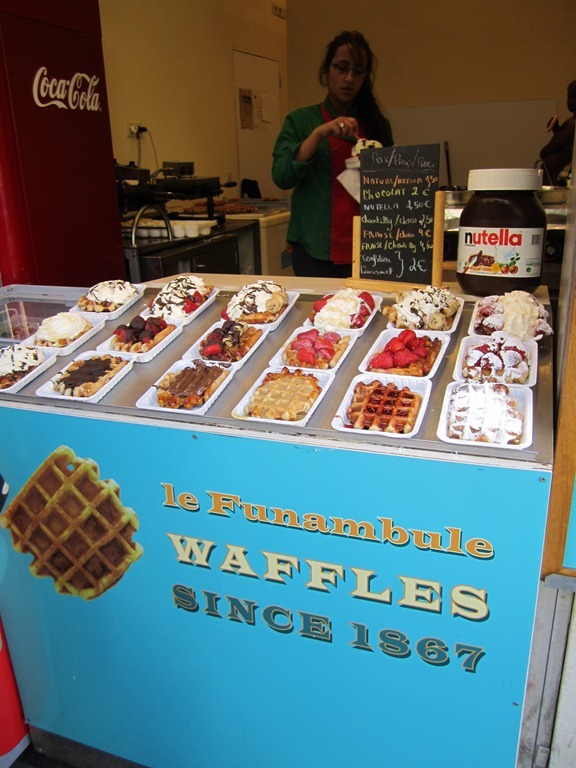 Once we emerged back into the fading day, the first thing I saw was a waffle stand, I couldn’t resist! The waffles were amazing and delicious! Although, they gave you the tiniest most useless forks to eat it with. It required sober patience to use the tiny fork without making a mess. Sober patience was lacking. We wandered back through the city center to get to our Hotel. I think we crashed at 8pm because of jet lag. But we woke back up at 2:30am and went on a late night hunt for more waffles.